Marketing a small to medium-sized business can be tricky, and it doesn’t help that there are many pitfalls to fall into along the way. If you want to ensure you’re getting the most bang out of your marketing buck, there are a few things you need to focus on so that you’re not throwing your budget away. Here are five common small business marketing mistakes that many smaller businesses make and how to shore up your weak spots. Obviously, every company needs a mission statement to run an effective business, but what does this have to do with marketing? Well, quite a bit, as it turns out. After all, your mission statement shouldn’t just reveal what you’re trying to accomplish – it also reminds you who you’re targeting. And marketing is all about the target. If your mission statement is vague or doesn’t focus in on who your target audience is, you will no doubt run into some roadblocks when it comes to marketing. Generational as well as cultural differences play a part in how you sell to your customers, so your mission statement is there to remind you of how your target demographic needs to be addressed. If you find yourself at the mercy of an unfocused mission statement, head back to the drawing board and make sure that your statement addresses who your target is and what you hope to accomplish for them. Sometimes half the battle in marketing is how you’re presenting yourself. Building a brand encompasses several aspects, including your design and how you communicate. Think of the catchy insurance slogans that you sometimes get stuck in your head, or that unmistakable logo that doesn’t even need to have a name next to it for you to know what company it belongs to. You recognize these brands because they have set themselves apart by creating a voice that cannot be duplicated easily. Content marketing services and other trust-building marketing methods are useful ways to give you a voice to support and amplify your brand. So essentially, you use marketing to create your brand, and as your brand matures it gives shape to your marketing strategies. Branding and marketing are essential and inseparable aspects of establishing and growing your company. While the days of keyword-stuffing to get more traffic are long gone, you still need to factor in SEO tactics when creating online content. Top-notch content is hard to find if there are no keywords for Google to pick up on, so be sure you’re investing some of your time and energy into keyword research before you write and publish content. After all, even the greatest blog post of all time is useless if no one ever sees it! Sometimes the best way to learn is through your mistakes. This is why tracking your marketing results is so crucial to the process. You need to know what is and is not working in order to tailor and further strategize your advertising, or otherwise you’re simply spinning wheels. There are many useful apps for tracking your progress with online marketing, but traditional print media can be a little more challenging. One easy way is to ask at some point during the sales process how a customer heard about you. This can let you know how the word is getting out and what is giving you the best results. It’s 2016, and a website alone just isn’t enough. If you’re not diversifying your marketing strategy, you’re missing out on a lot of potential business. Use various social media platforms and your website in tandem to create more interest, and invest in content marketing to ramp up awareness of your brand. Using a variety of tactics can help you reach much wider audiences and keep you from putting all your eggs in one basket. 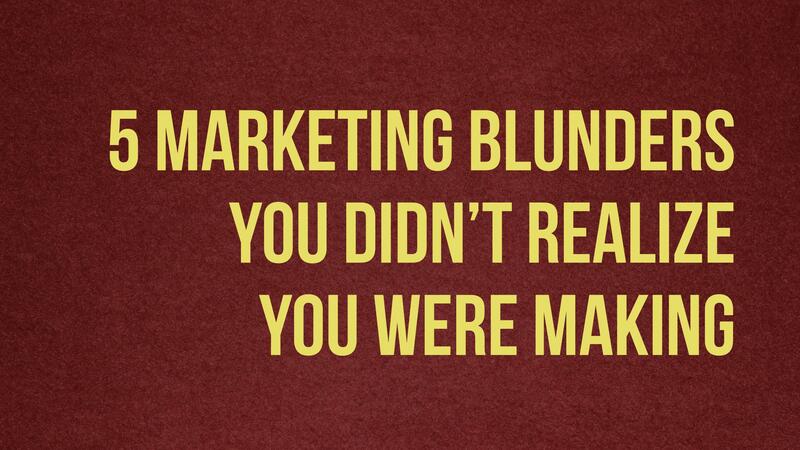 Marketing can be a difficult game, and there’s no need to make it any harder than it already is. By avoiding these all-too-frequent marketing blunders, you can solidify your strategies and get the most out of your campaign.